The expressway, likely to miss the March 2019 deadline, remains 64% incomplete with only three kilometres having been built since the ‘inauguration’. Massive water logging has led to cracks and parts of the road caving in. 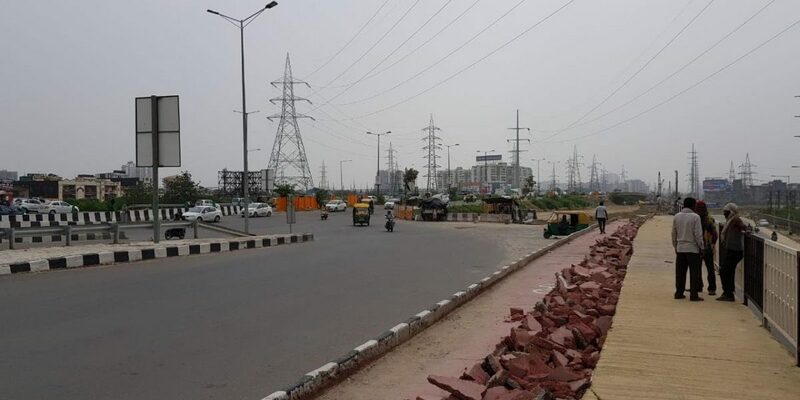 New Delhi: Two months after Prime Minister Narendra Modi inaugurated the first phase of a 69% incomplete Delhi-Meerut Expressway, cracks have developed on the eight-kilometre operational stretch of the proposed 82-kilometre expressway. A crack approximately 100 metres in length has opened up right through the middle of the cycle track of the expressway near UP gate in Ghaziabad – at the border of UP and Delhi where the expressway currently ends. The crack has been attributed to the rainfall that Delhi has seen over the last week. “There has been a lot of rain. Some water seeped under the cycle track causing the crack to appear. We are repairing it and it will be repaired soon,” said R.P Singh, project director at the National Highways Authority of India (NHAI). The NHAI has now dug up the damaged stretch of the cycle track and will be relaying it in order to fix the damage. Earlier, in June, after the first monsoon rains, a crack had appeared on the expressway and a part of the road had caved in. Reports have also claimed that the operational stretch of the expressway suffered massive water logging during the last week when heavy rains lashed large parts of northwestern India. An ABP news report, referring to the expressway as a ‘hanging canal’, showed cars being stuck due to water logging both on the elevated part of the expressway and on the road below. “A part of the cycle track had been dug up to allow the water to drain out, and that could have led to some water seeping through and going under the cycle track. 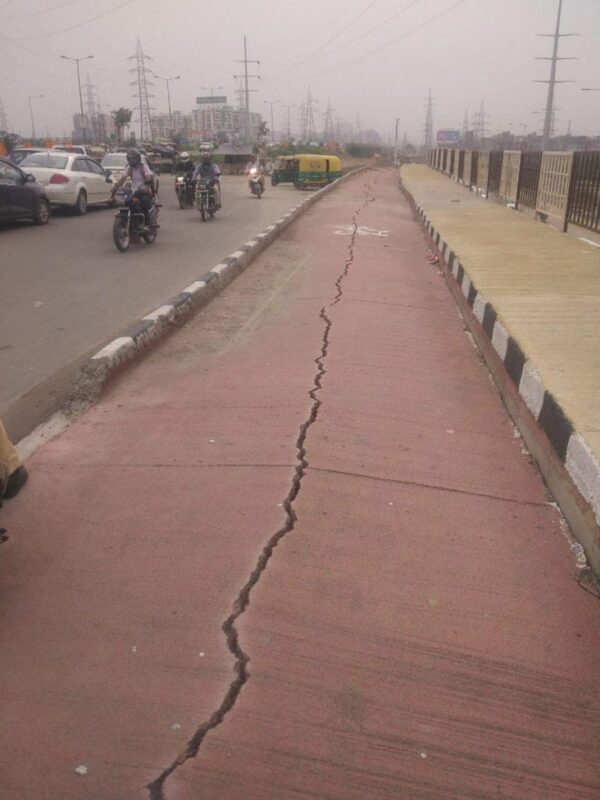 That is what, probably, led to the crack appearing on the cycle track,” said a source at the NHAI. However, officially, NHAI claims that the water logging was normal and the expressway is adequately prepared to deal with rains. “The rain was very heavy and the water logging was normal. There are adequate drainage mechanisms and there is nothing to worry about,” said Singh. On May 27, a day before by-elections in western Uttar Pradesh’s Kairana, Narendra Modi, in an elaborately choreographed roadshow, inaugurated the 69% incomplete expressway which is supposed to cut the travel time between Delhi and Meerut – an important industrial town in western UP, 70 kilometres from Kairana. 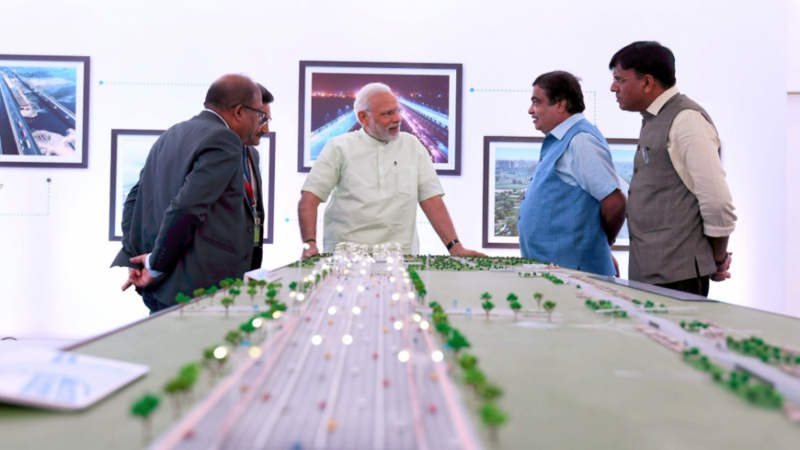 However, as The Wire had reported at the time, only 25.57 kilometres of the proposed 81.69 kilometre Delhi-Meerut Expressway had been constructed when the Prime Minister ‘inaugurated’ and ‘dedicated’ the expressway to the nation. Between then and now, the progress has been slow with only 3.76 kilometres having been constructed since the ‘inauguration’, according to the NHAI. At that time, 25.57 kilometres had been constructed and now 29.33 kilometres have been constructed. Thus, 52.36 kilometres of the proposed 81.69-kilometre expressway, or 64%, remains incomplete. A majority of the constructed expressway is part of phase 1 to 3, which involves lane expansions and service lane building. Phase 4, from Dasna to Meerut is the only greenfield phase of the expressway and at 31.78 kilometres is also the longest section of the expressway. This phase with only 2.86 kilometres constructed remains 91% incomplete. For phase 4, the land acquisition process remains incomplete. “There is some land acquisition that remains. There are pockets of land which are yet to be acquired for phase 4. But, the process will start soon,” said Singh. However, Singh remains confident of meeting the March 2019 deadline set by Nitin Gadkari for the completion of the entire 82-kilometre expressway. “We should be able to complete it by then. I don’t see why not,” he said. Modi laid the foundation stone for the Delhi-Meerut Expressway in December 2015 and the project has already missed a deadline. Initially, the NHAI had announced that the entire expressway will be operational by March 2018. Subsequently, owing to delays, in March 2017, the deadline was extended to December 2018. Now, according to sources at the NHAI, even the March 2019 deadline is unlikely to be met. “More than half of the expressway remains to be constructed. Land is still to be acquired. I don’t think it can be completed by March 2019,” the source said.